This is a hard-to-find finely preserved 18k. 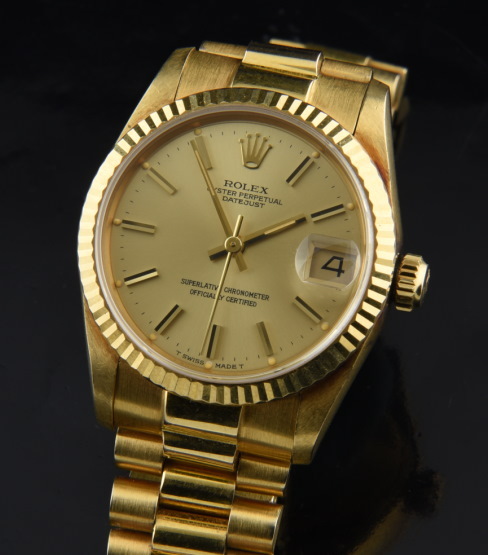 solid gold ROLEX DATEJUST mid-size (31mm.) men’s watch having a tight 18k. solid gold president style hidden clasp (original) bracelet, sapphire crystal and gold dial. This fine ROLEX watch dates to 1984 with a 8502xxx serial #. This ROLEX was just cleaned by our ROLEX trained watchmaker and is accurate. The case has not been polished, preserving the fine original finish which is without dings or major marks on the case or bracelet. The date has a quickset feature. These in-between sized ROLEX are becoming very difficult to find and are ideal for a man or woman who enjoys a subtle watch. Please be aware of the 31mm. size. Priced extremely well at $8750.